Some exhibitors at the annual boat show in Norwalk, Conn., preferred to talk about how the 38-year-old show draws noticeably fewer people these days, but others focused on how the buyers are gradually but clearly returning. Organizers say that about 20,000 attended the show, held Sept. 12-15 at the Norwalk Cove Marina. The turnout was in line with expectations, they say, and on par with last year’s showing. Bill Gardella Jr., general manager of the Rex Marine Center, which has hosted the show along with the marina since the mid-1970s, says a decent stretch of fall-like weather made for a successful event. Tom Pilkington, of the local Prestige Yacht Sales, says the Norwalk show is the preferred regional show for his brokerage. “It’s such a great show for local people that don’t make the trip to Newport or Annapolis,” he says. Prestige displayed three Hunt yachts and four Beneteau sailboats. It was the only sailboat exhibitor at the power-heavy show. Jim McManus, CEO of Hinckley Yachts, attended on the second day to support Ted Gersen, the builder’s regional director of sales. “We generally sell three boats here every year due to the proximity of our clientele,” McManus says. SeaSide3 Yacht Sales, based in Lindenhurst, N.Y., was showing the new Carver C34 Fly from its line, which also includes Marquis, Monterey, Jupiter and Cobia. Sales manager Phil Marsala says his dealership is willing to trade heavier traffic for a higher content of serious shoppers. “We’re seeing very interested people; there are buyers,” Marsala says, noting that he signed a purchase order for a Carver C34. Kelly Kraning, sales support manager for Carver and Marquis yachts, who attended in support of SeaSide3, says the positive signs are clear, but expectations remain muted. 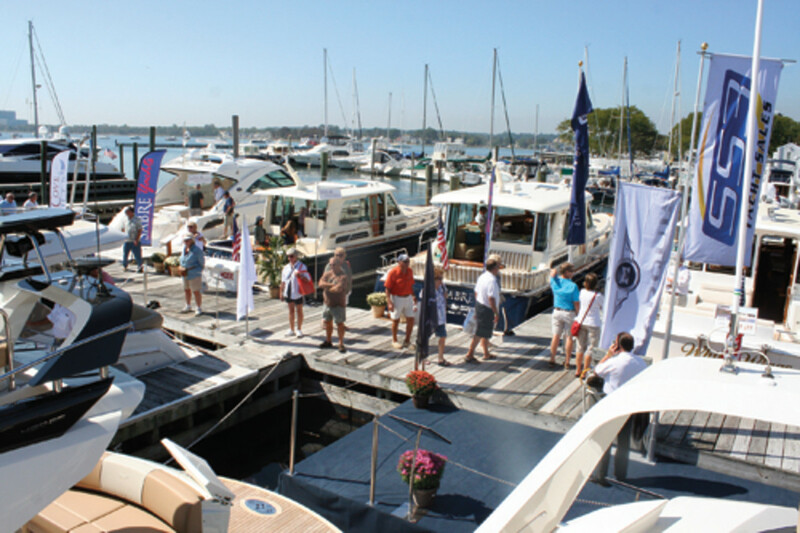 Fran Morey, director of training and service at Grand Banks Yachts, says coming off a successful Newport (R.I.) International Boat Show in Rhode Island the previous weekend, the smaller Norwalk show has its own incentives. “We’re meeting with fewer people, but they’re asking all the right questions,” he says.